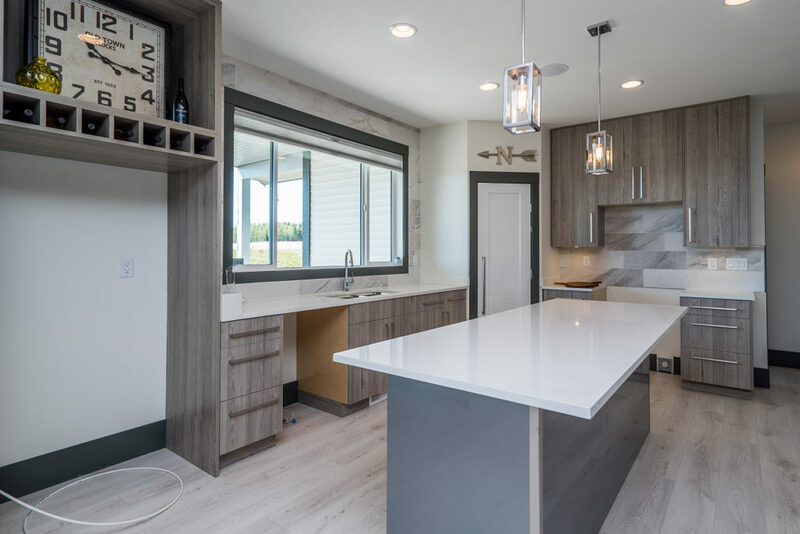 For more than 35 years, Vanway Kitchen + Bath has designed and planned beautiful kitchens for both custom and renovated homes across northern BC. While each kitchen has its own unique qualities, it’ll likely fall into one of three styles: traditional, contemporary, or transitional. Knowing what each of the three most common styles are can help you understand the differences between designs and narrow down your preferences when looking for inspiration. A traditional kitchen can be identified by solid wood doors with raised panels and detailed crown moulding. Often, the wood itself is a feature of the kitchen and is stained a deep rich colour to show it off to maximum effect. Additional architectural details like pillars and corbels can give a traditional kitchen a timeless elegant look. The kitchen below is an example of a traditional kitchen. Made from cherry wood, it has raised panels and detailed moulding by the ceiling. We’ve put together an album of additional traditional kitchens for you to see on Facebook, which you can view here. 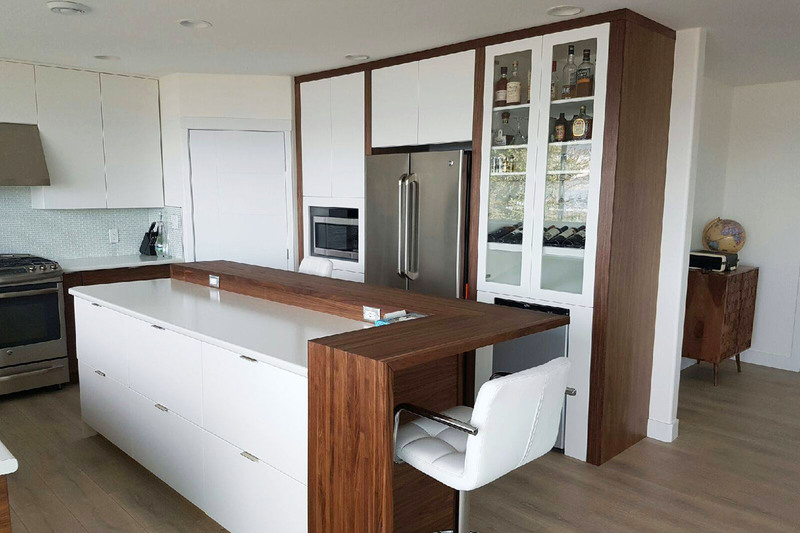 A contemporary kitchen can be identified by minimalist slab doors with a sleek, modern appearance. Rather than relying on natural woods, they may feature synthetic materials like laminates, glass, and metal. The emphasis is on straight lines, geometric shapes, and bold accents. Contemporary kitchens are most likely to feature bright colours and metallics. The kitchen below is an example of a contemporary kitchen. The doors are slab doors and there is no moulding anywhere. The minimalist handles are typical of contemporary kitchens, too. For more ideas, view our album of contemporary kitchens on Facebook. 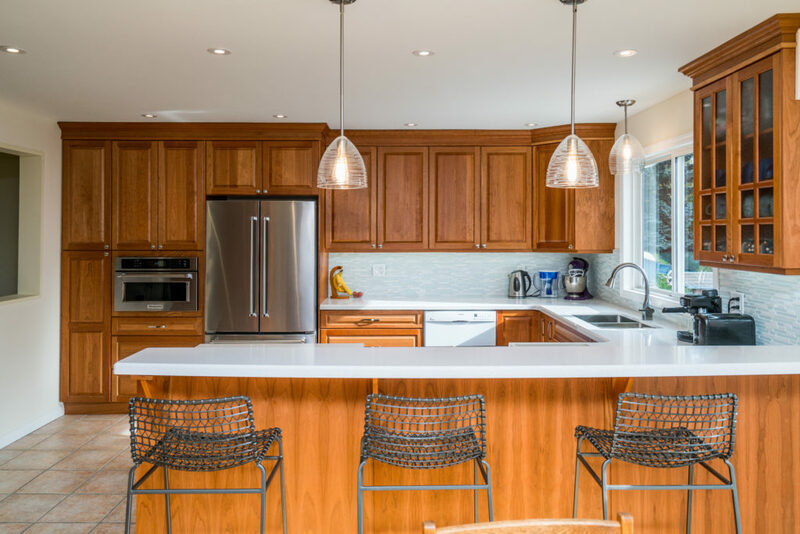 A transitional kitchen blends the best of traditional and contemporary styles together. The cabinet doors typically minimal moulding – the ever popular Shaker cabinets are an excellent example. Crown moulding, if present, has simple clean lines. The colour palette of a transitional kitchen is often neutral. Most of the kitchens in our inspiration gallery are transitional kitchens, as this is the most popular style of kitchen. The kitchen below is an example of a transitional kitchen. It has Shaker style doors and very plain moulding. You can also see more transitional kitchens in our Facebook album.